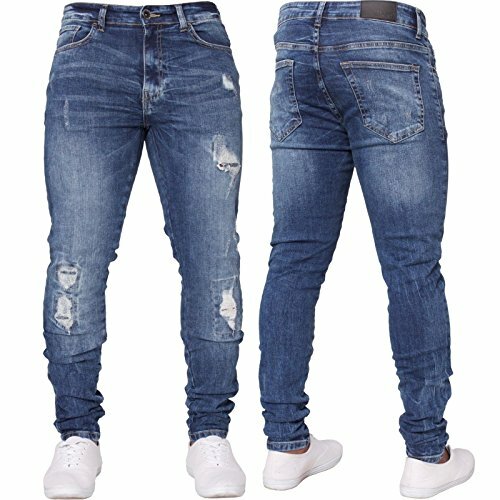 Men's Ripped Jeans - Exquisite distressed design and appropriate fading craft added a new fashion style. Men's Denim Jean - Washed down denim with whiskering and fading creating a vintage and charming figure. Guy's Destroyed Pants - Fashionable broken holes are full of powerful street feel and create an unique look. Boy's Skinny Jogger - Stretchy jeans with better pull tension, abrasion strength and comfort, flattering slim fit shadow. -1. Pls allow 0.2-1inch size difference because of the manual measurement. -2.Due to the different displays of the computers, the color of the real item may be slightly different from the picture shown. Material: Denim,Cotton.Excellent craftsmanship, fine texture, not wool, not ball, don't rub off. Fashionable item is appropriate for many occasions, particularly for outdoor activities or relaxing weekends. Retro distressing jeans can be pair with various tops, jackets, coats or casual shoes. Garment Care - Hand wash recommended. Machine wash cold, turn the jeans inside out and wash separately with like colors. Do not bleach, gentle cycle, flat or line dry only. Low iron if needed. If you have any questions about this product by SySea, contact us by completing and submitting the form below. If you are looking for a specif part number, please include it with your message.